The entire Lee Family (i.e. the hubby's side of the family) went to visit Adventure Cove on Christmas Day! It was the first time for most of us so we were pretty excited (the girl and I are theme park addict so naturally we were the most excited!). The lockers here are expensive in my opinion (costs $10 for the regular and $20 for the big ones!) so I recommend not bringing too many valuables so that you don't need a large locker. The only good thing about the locker is that it can be re-opened as many times as you like. Life Jackets are provided and I find them useful for the Adventure River and Bluwater Bay (wave pool) as the currents can be strong. However, they are not allowed on the slides. We started our day at Bluwater Bay because it was right at the heart of the water park. As we were early, we started with the first and scariest ride (with the longest queues as the day goes by) of the water park: Riptide Rocket! This is the first time we get to sit a conveyor belt to ride a slide instead of climbing the stairs! This ride is not for the faint-hearted man! It is Southeast Asia’s first hydro-magnetic coaster, which explains why I have never gone on something like that before even though I have been to countless of water parks. The ride is really fast, has plunging drops and is some serious business! My girl was so freaked out! The irony was that even though my girl met the height limit for the scariest ride in the water park, she did not meet the height limit for the rest of the slides which were nothing compared to this! So strange! Anyway, since the girl couldn't ride the big slides, she contented herself happily with the smaller slides at the kids playground, Big Bucket Treehouse. While the kids busied themselves with the playground, the rest of us went to ride all the slides. The slides were fun, though not as fun as the slides at Melaka Wonderland (they had much shorter queues too). The only slide that was better than Melaka Wonderland was the Riptide Rocket. 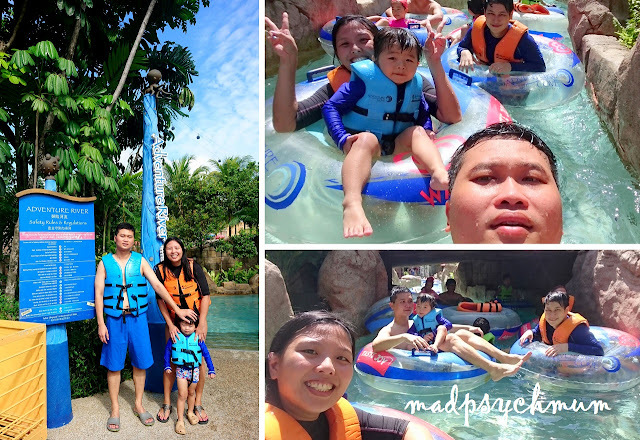 Nevertheless, Adventure Cove made up for the lackluster slides with the Adventure River, which was one of the best lazy rivers I've been in! Why? Because we got to get up close and personal with manta rays! So cool! Floating along a VERY crowded river! This underwater tunnel is so cool! The Adventure River also travelled passed the Ray Bay, which had the cutest manta rays I've ever seen! So pretty! 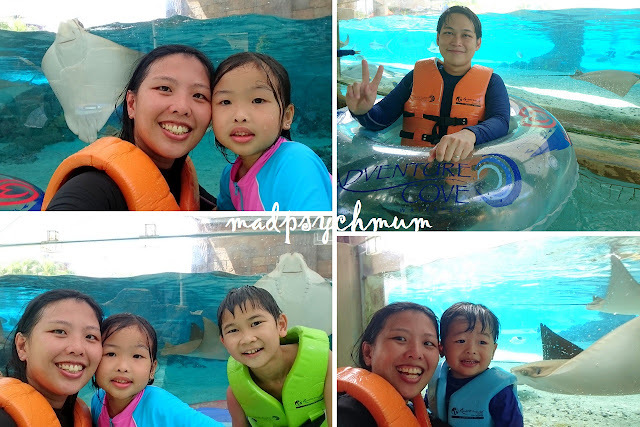 Taking lots and lots of selfies with the pretty manta rays! The other highlight of Adventure Cove for me was snorkeling at Rainbow Reef. It's probably the only place you can snorkel in clear waters in Singapore. It's not my first time snorkelling (I've snorkelled in Cebu and Thailand before) but it is the first time that I've snorkelled in Singapore! As the Rainbow Reef is about 3 metres deep, you must be able to swim in order to enter. Kids are not allowed. It's called Rainbow Reef because of the colourful fish! So beautiful! Please be careful where you tread. Do NOT step on the corals because let me tell you, that's not a pleasant experience! We ended the day with the newest attraction, the Wet Maze and obstacle course. There was a super long queue at the obstacle course and it wasn't as fun as I had expected.